On Wednesday we welcomed colleagues from across the industry and supply chain to the Digital Radio Stakeholders’ Meeting – Norway Special. 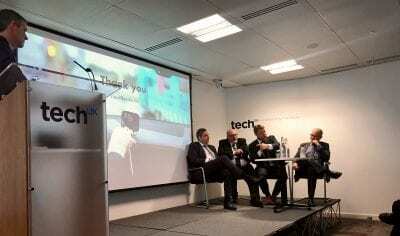 The meeting was hosted by techUK at their St Bride Street HQ and was attended by over 60 delegates. The Norwegian switchover, the world’s first, completed in December 2017 and the meeting heard from CEO of Digital Radio Norway, Ole Jørgen Torvmark, alongside a team of senior broadcasters representing Norwegian public broadcaster, NRK; commercial broadcasters, P4 and Bauer; and the Norwegian Ministry of Culture, who shared their insights and key learnings. The Norwegian delegation reported that there are 31 national stations available on DAB+, compared to just 5 national stations prior to the transition from FM, and the new digital stations have one third of all radio listening. Norwegian radio listeners have remained loyal with 98% making the switch digital radio. A record breaking 2 million DAB radio sets were sold in Norway in 2017 but persuading listeners to upgrade their cars to digital radio remains one of the biggest challenges. Following the presentations, Laurence Harrison of Digital Radio UK chaired a panel discussion featuring Ole Jørgen Torvmark, Digital Radio Norway, Jon Branæs, NRK, Kenneth Andresen, P4 Group and Lasse Kokvik, Bauer Media. The Norwegians emphasised that teamwork and collaboration across the industry, Government, regulators and supply chain had been essential and any switchover needed to be carefully planned. You can read the full report on the Norwegian DSO here. He highlighted the great progress that DAB has made including the great brand extensions, new content and choice available for listeners as well as the new distribution network. You can read Bob Shennan’s full keynote speech from Radiodays here. Global’s President and Founder, Ashley Tabor OBE, also made a statement on DAB, IP and FM, agreeing with the BBC that the time for a switch-off of FM is not now. He said, “We are delighted to fully support both DAB, and IP delivery of content. We have started many DAB stations on the D1 platform recently, invested in local DAB transmission and invested significant resources in new apps like The Global Player, home to all Global’s stations on mobile and connected devices. That said, around half of radio listening still comes from FM. With an installed user base like that, it would be premature to advocate an FM switch-off at this time.” You can read the full statement here.